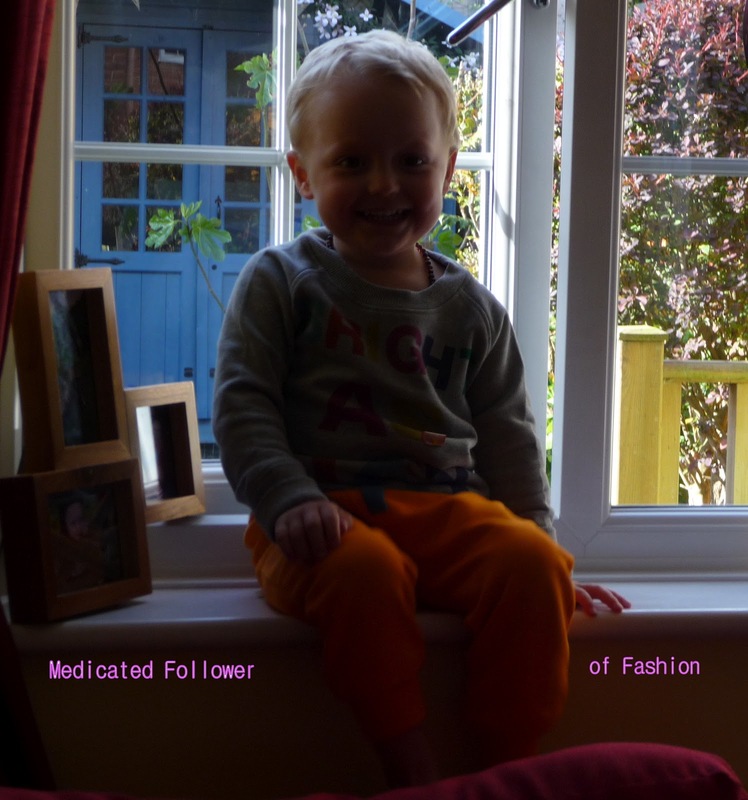 Medicated Follower of Fashion: Trendy Toddler Tuesday - Boys & Girls Review! It's Tuesday and it's that time again! Trendy Toddler Tuesday! This post is linked up with Maria from Very Busy Mama - please do go and check out her fantastic blog, she always has fantastic style ideas for Mama's and toddlers! Today I have a particularly exciting outfit of Ethan's to showcase. We have recently been the recipients of some gorgeous clothes courtesy of a wonderful brand, Boys & Girls. In case you don't know about Boys & Girls, I'll tell you a little about them. They have been around for just over a year, so they are very new but are already achieving a loyal customer base. Their clothes are all made using Fairtrade organic cotton which is something I love - you know it's going to be kind to delicate skin and is good for you concious. Not only do they use organic cotton, they also only use organic printing and dying methods so again, you know it will be kind to the skin. This is something I like - Ethan's skin is quite sensitive, he often gets eczema and dry skin patches. 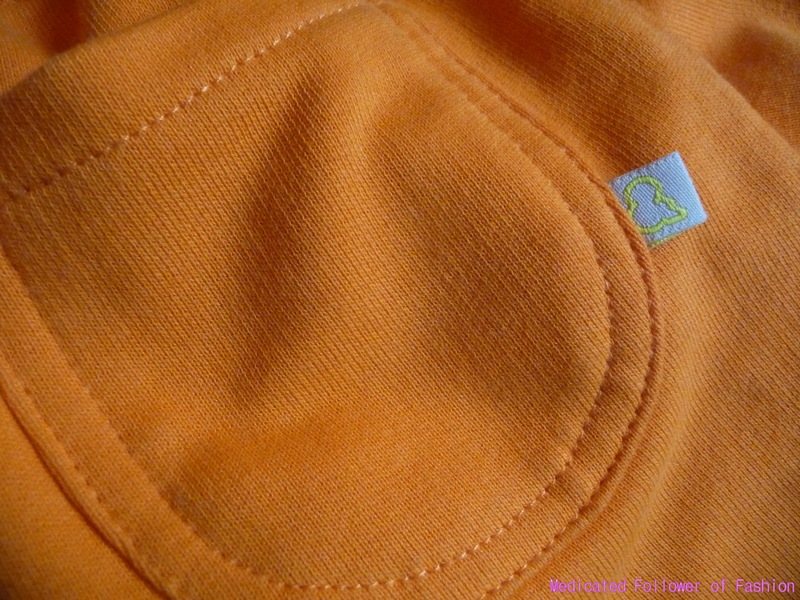 "Boys&Girls creates bright & brilliant clothes for 0-10 year olds.More parks & playgrounds than paddocks & ponies, we combine brilliant colours, the softest quality fabrics, and distinctive designs to create clothing that is perfect for today’s vibrant urban lifestyle." Why are B&G attracting loyal returning customers? Well, firstly, their range of clothes are exciting, different and unisex. Something that appeals to many parents I feel.. after all, parents of boys know how limited the high street variety of clothes is for boys (navy, green or brown anyone?) and parents of girls know how hard it can be to find clothes for girls that aren't all baby pink! B&G have it covered. How fantastic for hand-me-downs as well, great to know that many of the clothes you buy from them could suit a boy or a girl!! Secondly, the customer service is excellent. Parcels are sent out quickly, items are well packaged. Their packaging is recycled and attractive. You feel like you are getting excellent service! Postage is free on orders over £30 as well which is very reasonable. OK. On to the clothes themselves. I was lucky enough to be able to choose an outfit for us to review, but I have to say it wasn't easy. In the end I went for their tangerine sweat pants/tracksuit bottoms, a star print t-shirt and the "Bright As Day" sweat top. When the package arrived, I told Ethan what was in it and he helped me rip it open. 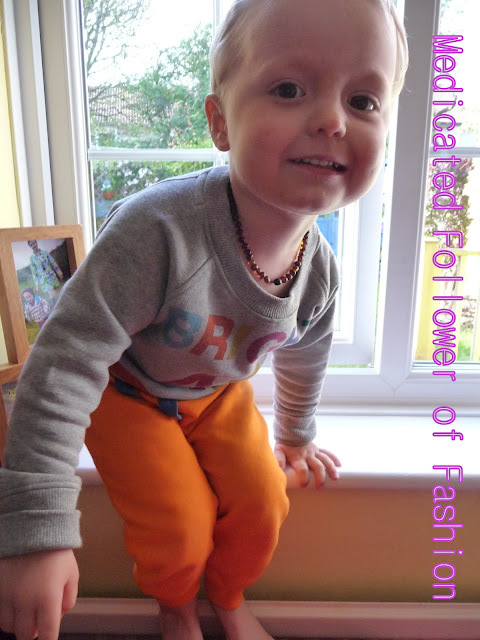 Straight away he went for the trousers, going mad about the colour "look at my orange trousers Mummy!" (I refrained from saying "they are tangerine darling, tangerine!"). 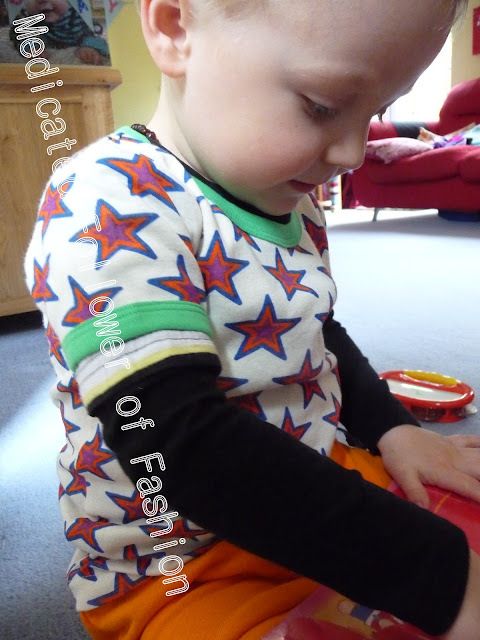 He also got very excited about the star print top, he adores stars. He's calling it his "Twinkle twinkle top". As you can see, I layered the star top over a black top - it was a bit chilly that day! It looked good like that but also looks lovely on it's own. 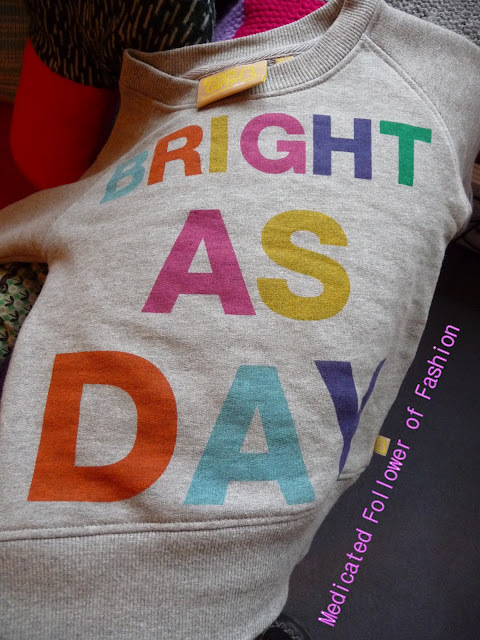 Bright as day really is the right phrase to have printed on their sweat top - their clothes really are! I hope you can see just how happy and bright the trousers are. Each time Ethan wears them we get stopped and people pay compliments and ask where they are from. I've never seen another pair as colourful! Ethan can't get enough of the and if I mention they are in his draw he just rushed up and asks to put them on! 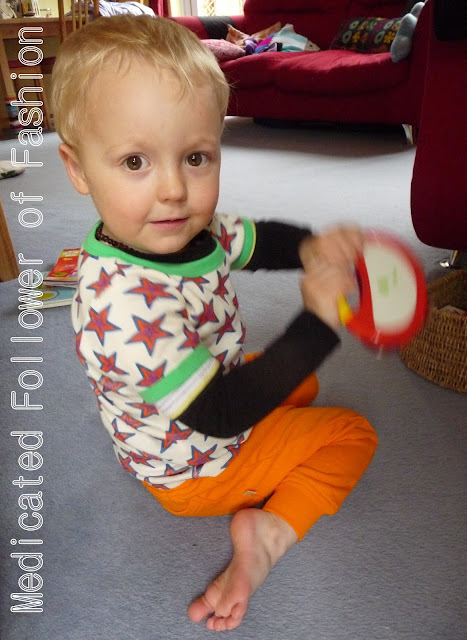 The clothes are soft and comfortable, just what a toddler should be wearing to run around in. They are excellent quality and stand up well to all his falls, even on rough ground. After several wears the all of the clothes look brand new still, especially the trousers. Something else I really love - their logo! It's very clever. Obviously it's an ampersand but at the same time it looks like a child sitting down! Fab. Nice and memorable as well! Something to bare in mind if you place an order - I was very kindly told by Kati who works at Boys & Girls that their tops tend to run a little small so it may be best to order a size above their age. I can confirm this to be the case, Ethan's tops were sent out in age 3-4 (he's not 3 until July and is only 92 cm tall so not big for his age) and they are just right on him. 2-3 would have been a bit tight perhaps and certainly wouldn't have had as much growing room. If you fancy checking out the Boys & Girls site at the moment, they are currently running a competition - your child can win a place in their Autumn/Winter photo shoot! So, if you've got a budding model, you should head over here. I know that Ethan and I are going to be fans of Boys & Girls from now on and I can't wait to see what their next collection looks like! You can find their website here and follow them on twitter @boysgirlsshop.